President Obama took office on January 20, 2009 in the midst of the Great Recession. Unemployment was skyrocketing as businesses laid off workers. It peaked at 10.3% in October 2009 (it would later be revised to 10%), the worst level in 26 years. 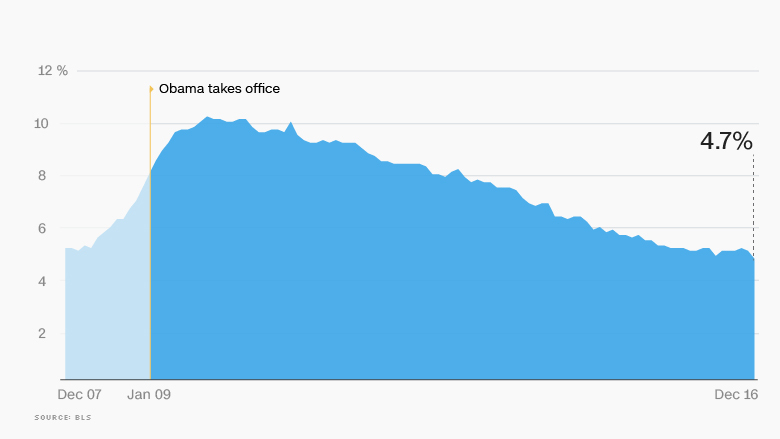 At the end of Obama's term, businesses are hiring and unemployment has fallen back to just 4.7% -- a reflection of a healthy economy. However, labor force participation (a fancy way of referring to the percentage of working U.S. adults) is at its lowest level since the late 1970s. The main reason is that Baby Boomers are retiring, combined with a segment of the population who stopped looking for work because they can't find anything.